I am most definitely late with this post. The muse departed promptly on my birthday, the official end of my 52-week project, catching me flat–footed before I had a chance to post #52. However, the two images that have been combined here were both shot in that final month, so I should be forgiven my tardiness. As for the muse, well, I just needed to leave the door ajar and the light on. 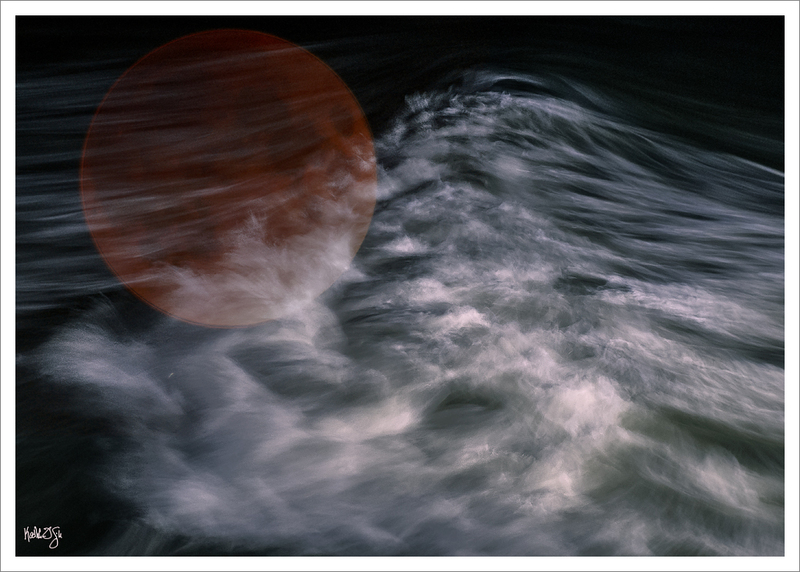 I photographed the “blood moon” from the dimly-lit parking lot of our hotel on the Eastern Shore of Maryland. I knew that photos of this eclipse would be posted all over the internet and that it would be difficult to do anything unique with it, but I shot it anyway. It was just something I had to do, like kissing the Blarney Stone. The evening was clear, warm for late September, with a light sea breeze. I was not thinking about the pull of the full moon – especially a “super-moon” – on ocean tides, but others were already preparing for what was coming to these southern shores. There were clues over the next couple days as we finished up on the Eastern Shore and made our way south toward the Outer Banks of NC, the weather still balmy. There were little things, like inconveniently-flooded parking lots along the waterfront, earth-movers shoving sand away from road shoulders and piling it high on the beach side of the road. And there were reports of closed roads on Hatteras and Ocracoke. For the most part, though, all seemed as it should on the tail end of tourist season. It wasn’t until a couple nights later that my head cleared and I realized what was about to happen, given the still-full super-moon and the remains of Hurricane Joaquin chugging slowly north from the Bahamas. As soon as darkness fell, we headed to Jennette’s Pier in Nag’s Head – partly out of curiosity, partly out of the need to experience something different on this last night of our holiday, but mostly due to my thirst for more photos. Admittedly, a fishing pier perched in the fitful wet wind of a coming storm, at night, is not the best place to go looking for photos. But I was bent on capturing this story, this feeling of being overwhelmed by the elements, of being insignificant in the face of nature unleashed. We made our way to the mid-point of the pier, stepping over the bait pails of dedicated fishermen. I made a valiant effort with the tripod, futilely fighting wind gusts, angry salt spray and intermittent light rain; I obsessively wiped spray from the camera and the face of my lens. Finally, I gave in, put the camera back in my two hands and started moving with the crashing waves, trying to capture their dark energy in a more abstract way. They came at me and the pier like the troops invading Normandy, singularly focused on their military objective, stepping undeterred over fallen comrades who had preceded them. I felt their rhythm and began to anticipate their moves, focusing on the next wave as it thundered toward me, following its progress as it moved past my position on the pier and hurried away from me toward the shore. Soon the elements were forgotten and creative bliss rediscovered, muse momentarily parked on my shoulder.